The Broadway star reveals how she maintains her beauty on and off the stage. Brandy may star as Roxie Hart in Broadway’s long-running revival of Kander & Ebb’s Chicago, but the Grammy-winning singer, is more than meets the eye. Here, the singer dishes on how she maintains her beauty on and off the stage. ESSENCE.com: As anything about your haircare routine changed since being on portraying Roxie on Broadway? Brandy: Well, I’m lucky to wear a great little wig for Roxie. It started off red but they turned it into black, which is my favorite color for hair. As for my natural hair, I take really, really good care of it. I use the Moroccan Oil line. My natural hair is very, very healthy and I’m really happy with it. ESSENCE.com: You said that you like wearing black. Why is that? Brandy: I think my mom put it in my head [long ago] that black hair really brings out my features. Like my cheekbones and my Asian eyes features. She put that in my head, so I stuck with that. ESSENCE.com: So no red or blue, or blonde, huh? Brandy: No, no, no! I’m not doing red and blue. ESSENCE.com: I’ve noticed that you’ve worn afros and different big or curly styles. 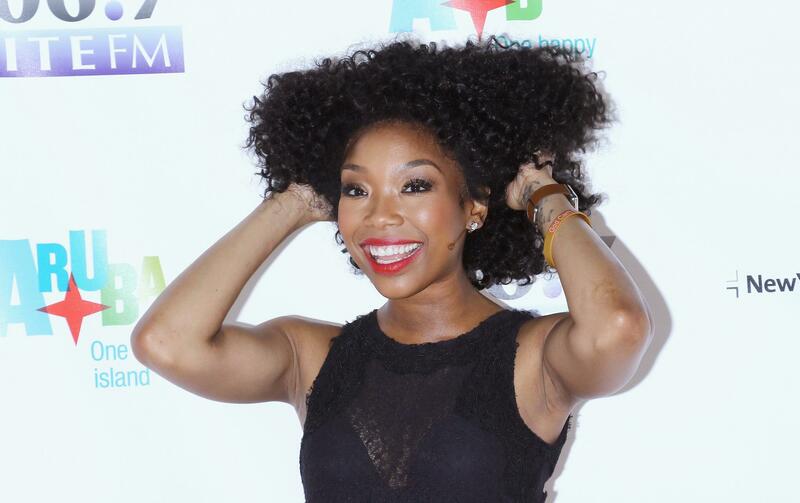 Brandy: That’s one of my favorite styles, is the big curly hair and the braids. I love braids, and twists, and I love the natural expression, that’s my thing. If it were left up to me, I would actually loc my hair, but I’m an actress too, so I have to be versatile. If it were left up to me, I would do the locs. ESSENCE.com: Really, why is that? Brandy: Because I think it’s so beautiful. It’s just a part of who I am. I’ve been wearing braids for years now. That’s what I first came on the scene, with braids. I just feel pretty in braids, and pretty in the natural stuff, it just makes me feel more like myself. I love it on other people. I love seeing it on other people. They look so beautiful to me when I see it on other people. ESSENCE.com: Do you think braids and locs bring out your beauty in ways that an afro can’t? Brandy: Yes, I do. It feels more natural, it feels more like me. The whole natural movement, it’s just different. It just feels like inner beauty is coming to the surface and it just comes out through your eyes, and face, and hair. That’s what it feels like. ESSENCE.com: I’ve also noticed that you’ve been wearing a fair amount of scarves recently. Brandy: That’s a part of the whole natural movement, too. You know, the scarves, the turbans, you can tie them different ways. Put the knot at the top of you head. There’s so many ways to wear them. ESSENCE.com: What brands are you into? Brandy: Free People is my favorite. ESSENCE.com: What do you love most about being a black woman? Brandy: I love the freedom and I love the feeling of feeling fearless. Fear can cripple you and I was afraid for a very long time. I just don’t feel that way anymore. I haven’t loved being me, the way I am now in a long time. I realized that I needed me the whole time. Now that I have that, I’m very, very blessed.